YAVORIV, Ukraine -- American troops are training Ukrainian forces on Russia's doorstep, a move seen as a major provocation by Vladimir Putin's regime. 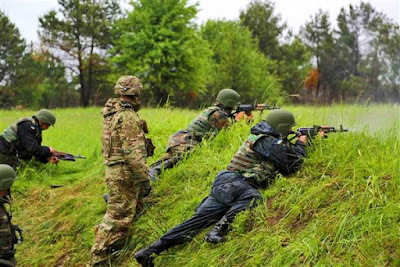 U.S. Army instructors train Ukrainian military forces in Yavoriv, Ukraine, on May 27. The live-fire drills and counter-insurgency exercises involving about 300 U.S. paratroopers are a key bone of contention for Moscow, which the West accuses of helping to arm pro-Kremlin rebels in eastern Ukraine. The U.S. military has previously conducted exercises that involved Ukrainian soldiers, but the direct training is a first. Relations between Washington and Moscow are at their lowest ebb in decades with former Soviet leader Mikhail Gorbachev warning late last year that the world was "on the brink of a new Cold War." Russia has also been excluded from this weekend's G-7 summit in Schloss Elmau, Germany, due to its annexation of the Ukraine's Crimea region. U.S. President Barack Obama, upon arriving in Germany, said the summit would discuss Russian "aggression" in Ukraine. During the current six-month mission which began in April, the U.S. military is working with more than 700 Ukrainian soldiers in three rotations. Trainers say that their students are improving quickly. "From what we saw at day one to where they are at right now, they've proven their willingness to learn," Capt. Nick Salimbene told NBC News. "They're getting better on a day-to-day basis." The training by members of the U.S. Army's 173rd Airborne Brigade is taking place about 700 miles away from the front lines in Eastern Ukraine, where fighting intensified late last week. According to the U.N., at least 6,400 people have been killed in the conflict since April 2014. It is never far from the minds of the Ukrainians being taught by U.S. service members. During a recent visit by NBC News to the Yavoriv training center, two young Ukrainian National Guardsmen fired RPGs and watched as a wooden tank outline at the other end of the field splintered into pieces. The soldiers cheered in unison with their comrades and their American trainers. The heavily-armed unit had made its way through fields shooting at pop-up targets and simulating the take-over of a command post. "This is a scenario they could see in the conflict in the east," 2nd Lt. Ty Boyle, one of the American trainers, told NBC News. The American training is at the request of the Kiev government, which is trying to modernize its military. But Moscow isn't happy about it. "The participation of instructors or specialists from third countries on Ukrainian territory, where the domestic Ukrainian conflict is unresolved, could destabilize the situation," Kremlin spokesman Dmitry Peskov told reporters during a conference call when the training was launched in April. Ukrainian soldiers undergoing the training told NBC News that they expect to soon return to the frontline and said that the American efforts to teach urban warfare, counter-insurgency operations, and anti-propaganda training would help them. U.S. military officials insist its military support is limited to defensive efforts. They say that they deliver no weapons, only protective gear, medical kits and vehicles — and only train soldiers of the National Guard, which is limited to missions inside Ukraine's borders. But ongoing training is also a sign toward Moscow that the United States will stand by the Western-oriented government in Kiev. "It demonstrates that the U.S. is there to stay," Maxim Shepovalenko, a military analyst at the Center for Analysis of Strategies and Technologies in Moscow, said. While U.S. support to the Ukrainian military is unlikely to change the balance on the battlefield, he highlighted parallels with another conflict. "This all is very reminiscent of the 50-year-old story with Vietnam," Shepovalenko added. "The U.S.-Vietnam involvement started with instructors as well and then it developed into a full-scale military involvement."